What Happens to a Predeceased Beneficiary's Share of an Estate? The death of a beneficiary is one of the greatest problems that can occur when a last will and testament or a revocable living trust isn't regularly updated. When a beneficiary dies before the testator—the person who left the will—what happens to that person's share of the estate if he's no longer alive to receive it? It depends on what the will or trust says—or doesn't say—about the predeceased beneficiary's share. The will might say, "I give 20 percent of my estate to Bob if he survives me." If Bob doesn't survive the testator, Bob's share of the estate will "lapse." In other words, Bob's 20 percent share simply ceases to exist because he's no longer living to accept it. So what happens to it? It typically remains in the estate to be divided among other beneficiaries. Bob's lapsed 20 percent would become part of what's called the estate's "residuary", what's left after all the other specific bequests are made. In most cases, the residuary of the estate will move to other surviving beneficiaries. For example, Bob might have been given 20 percent while Sally received 40 percent and Joe received 40 percent. Because Bob's 20 percent is absorbed back into the estate, effectively making it larger than it would have been if he had been able to accept his share, Sally and Joe's shares grow. They would now receive 50 percent each, both of them gaining half of Bob's unclaimed bequest. What if the will says, "I give 20 percent of my estate to Bob if he survives me. If Bob doesn't survive me, I give 20 percent of my estate to Bob's then living descendants, per stirpes." Per stirpes translates to "by roots." In this case, the roots are Bob's children. If Bob isn't living but he is survived by two children, Sally and Walter, then Sally would inherit 10 percent of the estate and Walter would inherit the other 10 percent of Bob's share. They would each receive a 50 percent share of their father's inheritance. Now let's really complicate things and take the per stirpes clause to its next level. What if Sally is also deceased but is survived by two children, Alex and Zane? In this case, Alex would receive 5 percent and Zane would receive 5 percent. Walter would receive his original 10 percent. Each deceased parent's share passes to his or her children in equal measure. What if the will states, "I give 100 percent of my estate to Bob," and that's it. Nothing else is written. There are no other beneficiaries and Bob is deceased. Now, what happens to Bob's share? Each state has a prescribed list in its statutes as to who inherits when this happens. It's called "intestate succession". 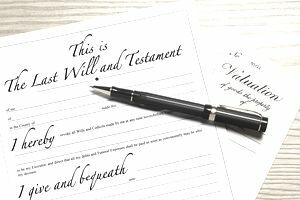 The estate will most likely pass to the deceased's closest kin based on his state's intestacy laws—not Bob's kin because Bob's own death has made the will void. These laws come into play when a decedent dies without an estate plan. The lion's share of the estate typically goes to the surviving spouse with the decedent's children also getting a share. It's possible that no one else—not siblings, not the deceased's parents, and certainly not Bob's descendants—would receive anything if the deceased left both a surviving spouse and children. The deceased's most immediate family would most likely inherit everything provided that they had not also predeceased the testator. They'll get Bob's 100 percent, even if that's not what the deceased wanted or intended. Estate planning attorneys usually recommend that you update your will or living trust after life-changing events such as the death of a named beneficiary. It will save your estate time and money in the long run and your true wishes will be clear and unambiguous.